Last week on Bogota city tour…think Karate Kid movie. 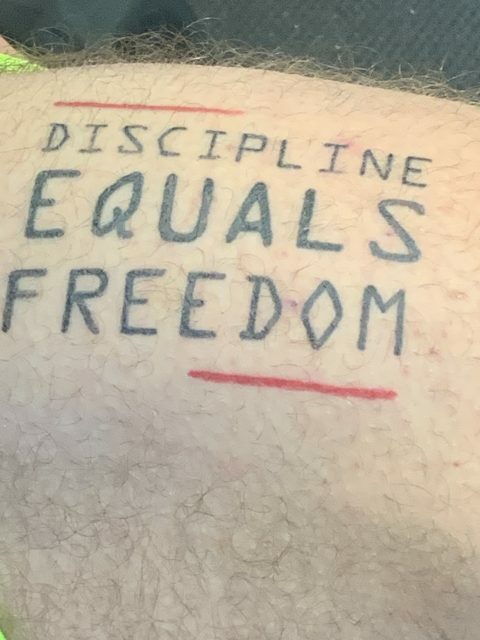 From a conversation at the gym yesterday, a tattoo is revealed. i asked someone why they work out so hard if they aren’t training for something and he rolled up his pant leg. There are some things happening in my business this month that are incredibly exciting, as the result of having an exclusive booking agent. And, WordPress 5.0 just released a few days ago and i am using this site (jeffnoel.org) as the lone updated site – until i learn how to navigate the new admin (writing) backend. The change requires me to adapt (happily) to a new way (not optional) of writing and adding media. It’s slow and clunky during these first few days. This is why i’m holding off on updating the other four Mid Life Celebration blogs – 80% of the writing is the old (fast) way and only 20% is the new (slower for now) way.